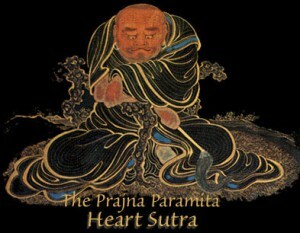 More than any other sutra, the Heart Sutra is aptly named because it represents the very Heart of Noble Wisdom Itself. It is the essential-core of the Prajñāpāramitā teachings from which all other sutras focusing on Noble Wisdom acquire their classical impetus. It is the very deposit of Āryajnana. Māra fears this sutra most of all since It completely dismantles his four-fold stranglehold on sentient beings: the Māra of the five aggregates (skandhamāra), the Māra of the afflictions (kleśamāra), the Māra of death (maranamāra), and also that which prevents one from transcending the other three—his own deity-nature (devaputramāra). The Heart Sutras’ Mantra is the sacred-formula that is the antidote to Māra’s determination to prevent one from awakening on the Other Shore of Deathless Suchness, the awakening to one’s own Nirvanic-Kingdom of Self—the Dharmakaya. As we shall discover in this Heart Sutra series, the three-pillars of Tathagatagarbha Zen are also inter-enveloped within Its Transcendent Structure: the Buddhagnosis as conveyed by Avalokiteśvara; the primordial Source that gives rise to his teaching—the Blessed One’s own “shared” Deep Samādhis; and the Bodhiprajñā (the Undivided Awakened Noble Wisdom from the Other Shore of Deathless Suchness) that is won when the adept faithfully takes refuge in the Sutras mystical and mantric import. My primary resources for this series are Red Pine’s commentary of The Heart Sutra and Donald S. Lopez, Jr’s excellent dharma-study—The Heart Sutra Explained. I have also discovered that the best time to chant the Heart Sutra’s mantra—Gate, gate, Paragate, Parasamgate, Bodhi, svaha—is late in the evening before retiring for sleep. The close of the day (nocturnal epilogue) best transmits the energies of the Cosmic Transformative Buddha—Vairocana—as all form-based sub-realities fade-away into the rapture of Dharmakayic Ecstasy. This entry was posted in The Heart Sutra and tagged Heart Sutra. Bookmark the permalink.